The Preserve on the Elizabeth community is sold out and is not in active development by builder. If you are interested in The Preserve on the Elizabeth or similar new home communities, contact us today! Our agents are very familiar with new and newer construction in Chesapeake, and can identify resale opportunities in The Preserve on the Elizabeth, as well as builder inventory available in nearby or similar communities in Chesapeake. To view 15 more pictures, interactive maps and the full, detailed description of the The Preserve on the Elizabeth community, please Login. The Preserve on the Elizabeth presents new construction properties that will delight homebuyers. This land of green spaces, trees and paths invites pedestrians into this suburban oasis. 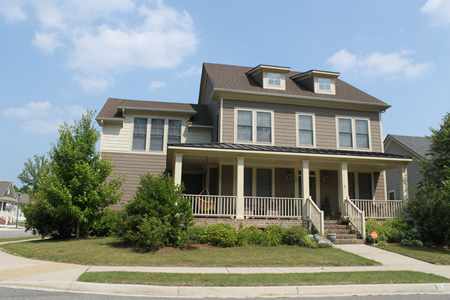 This lovely cluster of homes sits in a serene section of Hampton Roads in Chesapeake, VA. This location allows residents to easily commute to nearby military bases like Norfolk Naval Shipyard, Naval Medical Center Portsmouth and the Coast Guard Finance Center. The land is an eye-catcher but what really draws attention are the properties. The homes are divided into two categories- Park Homes are nicely appointed, single-family residences and Manor Homes are larger houses. New construction homes are not always so dolled up as they are here. A home in The Preserve on the Elizabeth may feature front porch, open floor plan, kitchen island, home office, media room, first floor master suite, dual-zone heating and cooling system, hardwood flooring, library and more. Life in this new construction community is better than homebuyers may have ever expected. Aesthetically pleasing fields, parks, a butterfly park, birdhouses and wildflowers provide natural wonders throughout this newly developed land. Residents can take time to enjoy the simple pleasures of life without even leaving their new homes. The Preserve on the Elizabeth also offers a clubhouse, pool, fitness room, kitchen, lounge, fireplace and event room. These amenities help homeowners stay active and lead fulfilling lives. If anyone wonders why this area of Virginia keeps growing, they have never come for a visit. Take a look around; there is always something to do. Golfers can meet other players and share a love of this sport at Cahoon Plantation and Chesapeake Golf Club. Like Arbor Day? Try the Chesapeake Arboretum when looking to unwind. Pack a picnic to enjoy beneath the pecan trees and keep those eyes peeled for wildlife. Homebuyers from diverse backgrounds can appreciate the beauty of the land on which this new construction community has been built. Stay active, relax or just enjoy life at The Preserve on the Elizabeth. Owning one of these properties puts everything into perspective. Send me more information about communities similar to The Preserve on the Elizabeth. Our agents gladly offer FREE property tours of The Preserve on the Elizabeth, Chesapeake and homebuyer consultations to all serious buyers.